The films of Christophe Honoré exist on a very special plane of reality. At once stylized, romantic, and yet bracingly immediate, they feel like something out of another time, incorporating elements of the French New Wave (especially in his 2008 film, Love Songs), and French musicals such as The Umbrellas of Cherbourg. His latest film, Beloved (Les Bien-Aimés), is something of a different animal. Longer and perhaps more unwieldy than his previous work, the film is a love story that spans generations, from the 1950s to today. Following the romantic travails of a mother and daughter, and how they reflect and compliment each other, Beloved winds its way through the latter half of the 20th century and the first decade of the 21st. Madeline (Ludivine Sagnier as a young woman, Catherine Deneuve in her later years) stops to change shoes one day, when she is propositioned by a man on the street. It is there that she decides to become a part time prostitute for some extra money. Catherine Deneuve and Chiara Mastroianni in BELOVED, directed by Christophe Honoré. Photo by Jean-Claude Lother. A Sundance Selects release. Her life changes, however, when a Czech doctor named Jaromil (Radivoje Bukvic as a young man, director Milos Forman as an old man) picks her up and then never leaves her life. The two fall in love, and she moves to Czechoslovakia just in time for the Russian invasion of Prague. The pair have a daughter, Vera (Chiara Mastroianni), and Madeline returns to France where she marries a Frenchman and attempts to live happily ever after. Those attempts are short lived, however, when Jaromil returns from Czechoslovakia to pursue her once again, starting what will become a decades long love affair held under her husband's unsuspecting nose. Vera's story is no less complicated. Already in a relationship with Clément (Louis Garrel), she begins to fall for an American ex-pat named Henderson (Paul Schneider), who, as it turns out, is gay. But this being a Honoré film, it doesn't stop there. Henderson slowly begins to develop feelings of his own for Vera. But the complications of their situations and the distance between them may be too much for them to bear. Yet despite their differences, and Henderson's sexuality, it soon becomes clear that maybe they are meant for each other after all. Ludivine Sagnier and Rasha Bukvic in BELOVED, directed by Christophe Honoré. That's one of the things I respect and appreciate the most about Honoré's films. In Honoré's world, sexuality doesn't really matter all that much. That's not to say his characters are promiscuous or unscrupulous (although that is sometimes the case), rather love tends to be bottom line rather than the label one ascribes to themselves. It's a bit idealistic, one might even say it's naive, but Honoré's films tend to exist in their own kind of unique reality. It isn't that he views the world through rose-colored glasses; not everything turns out the ways its characters want or envision, but there is an undeniable romanticism to his work, and Beloved is no different. The problem here is that Alex Beaupain's music isn't as memorable as it was in the superior Love Songs, and at 134 minutes it's his longest work to date. While the songs flow naturally out of the situations rather than causing awkward breaks in the action, Beloved tends to meander rather than congealing into a satisfying whole. It never justifies that running time, losing focus between its four love stories to the point where none of them really get the attention they deserve. It spends far too long away from its most interesting elements (namely the relationship between Vera and Henderson) to the point where it is unable to sustain the kind of audience engagement it needs to keep going. Honoré once again nails the atmosphere, leading to an enjoyable if somewhat disconnected viewing experience. He stimulates our eyes and our emotions, but the film's lack of focus keeps us from really getting to know these characters. The Honoré elements his fans have come to love are all here, but the package is somewhat bloated and lacking that extra spark he needed to make the magic truly come to life. 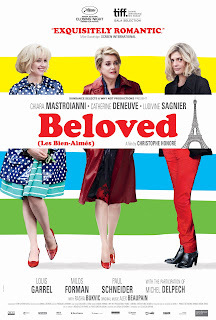 BELOVED | Directed by Christoph Honoré | Stars Ludivine Sagnier, Catherine Deneuve, Chiara Mastroianni, Rasha Bukvic, Milos Forman, Louis Garrel, Paul Schneider | Not rated | In French w/English subtitles | Now playing in select cities.